This is your exclusive invitation to attend Elliott Wave Internationals first-ever online video conference for free. The global market outlook is far less rosy than world leaders would have you believe. In their speeches, proclamations and world economic summits, politicians and central bankers reassure investors that the credit crisis of 2007-2009 will turn out to be nothing more than a footnote in market history -- despite the compelling evidence that it never truly ended. Meanwhile, US Congress is once again facing a dangerous deadline for solving its gargantuan budget woes, Europe remains in turmoil, and Asian-Pacific regions and emerging markets are charting surprising courses of their own. As the year 2013 goes forward, do I have the means to prepare for tomorrow's news today? Elliott Wave International's top analysts have already gone on the record -- with the cameras rolling, literally -- to discuss markets from oil to stocks to bonds, in the US, Asia-Pacific, and Europe. From now until Feb. 20, you can watch and listen to their commentary, free, via this exclusive invitation to attend EWI's first-ever State of the Global Markets Online Conference. And more, including a 40-minute keynote from Robert Prechter on Feb. 17 and a Q&A video presentation Feb. 19. To get ahead of the markets in 2013, you must think independently. This weeklong online conference -- in addition to the 40-page report -- gives you the tools and direction you need to gain a competitive edge. Don't miss out on dozens of independent global market insights that will prepare you to survive and prosper in 2013 and beyond. 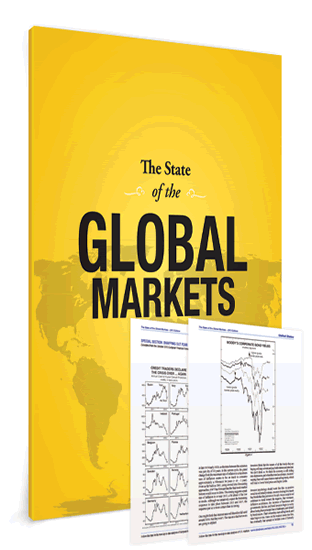 >> Follow this link to download your free 40-page report, The State of the Global Markets -- 2013 Edition, now. P.S. The online conference ends 5 p.m. Eastern time, Wednesday, Feb. 20. And the report is available to you for free for a limited time. Enjoy these exclusive free resources now while their valuable year-in-preview advice can help your portfolio in the New Year. Learn more about the conference and download the 40-page report now.